“Miss Patsy,” and on February 16, 2013, we said goodbye. Like many du Ponts, Miss Patsy grew up in Wilmington, Delaware, but she attended St. Timothy’s School in Baltimore County. After the death of her father, Archibald du Pont, in 1942, the family estate, Montchanin, was sold. By this time, William du Pont, Jr. had established the 8,000-acre estate in Cecil County known as Foxcatcher Farm. Miss Patsy acquired an adjacent 500 acres, establishing her own stronghold known as Fairview. 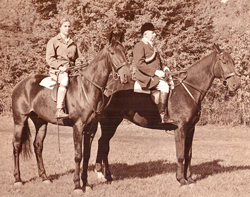 Already a well-known horsewoman in the hunter show world, Miss Patsy began hunting regularly with Foxcatcher Hounds, becoming a Joint Master for several years around 1949. Photos show her in informal hunt attire, which she preferred. However, her formal turnouts were traditionally impeccable, and she was always mounted on a well-schooled, good-looking horse. In 1953, Mrs. Dean (Louise) Bedford proposed the idea of creating an American Pony Club organization to Miss Patsy. Based on the original British Pony Club, the goal was to teach youngsters the proper approach to good horsemanship with proper care, grooming and riding skills essential to the welfare of the horse or pony being of utmost importance. It was that concept that most inspired Miss Patsy. In 1954, 22 Pony Clubs were registered, with the Fair Hill Pony Club one of the first. Miss Patsy began filling her stable with suitable mounts and equipment for youngsters 11 and older. Unlike other Pony Clubs, the Fair Hill Pony Club received the benefit of being completely underwritten and sponsored by Miss Patsy. She maintained over 30 mounts, taught summer sessions, and provided trips to the Madison Square Garden Horse Show in New York City. She hired the notable instructors Sylvia Hector, Fred Pinch, and others to give youngsters the best experiences she could provide. By 1958, some of the early FH Pony Clubbers were teaching the beginners, parents became involved, and their numbers grew. For forty years hundreds of children benefited from the program—and many of those Pony Clubbers are to this day still actively involved with horses. In the early days of the Pony Club system, it was required that the clubs be associated with a pack of hounds registered with the Masters of the Foxhounds Association, so the Fair Hill Pony Club was attached to Mr. William du Pont’s Foxcatcher Hounds. The more experienced riders who had proven themselves under Miss Patsy’s watchful eye were given the opportunity to hunt with hounds over the Christmas school break, and to participate in a staged mock foxhunt in which all roles of the hunt were enacted by the Pony Clubbers. The most experienced riders would assume the roles of fox, hounds, huntsman, and field master. Others enjoyed the chase as members of the field. After Mr. du Pont’s death in 1965, Miss Patsy arranged for her pony clubbers to foxhunt with Ross Taylor and quietly supplied staff horses and paid some of the staff. 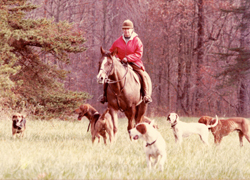 In the early ‘70s, Miss Patsy acquired a pack of Penn-Marydel hounds, hunting her own hounds on Fair Hill as an informal farmer’s pack, while Foxcatcher continued to hunt Fair Hill as the primary formal pack, now with William du Pont’s daughter, Jean Sheehan, as Master.In 1974, the du Pont family sold the 5,000-acre portion of Fair Hill that was in Maryland to the State of Maryland as a state park, but Master Sheehan was able to retain exclusive foxchasing rights. When Master Sheehan retired the hunt colors and disbanded the pack in 1980, Miss Patsy arranged a lease with the state of Maryland to allow foxchasing to continue on Fair Hill. She sponsored the hunt and allowed others to hunt with her under guidelines established in the lease. She continued to hunt hounds until she felt she could no longer follow hounds on horseback. She then hired local farmer/huntsman Andy Ford to hunt her hounds under her supervision and direction. Kevin White, a du Pont employee, apprenticed with Mr. Ford, and assumed the horn as huntsman in 2005, continuing as huntsman until Miss Patsy’s death this year. Miss Patsy’s love for her animals was her passion. While she was gracious and generous, she made it clear that she was not to be underestimated in her commitment to that passion. She didn’t hesitate to rebuke one whose actions met with her disapproval. Her life was dedicated to the care of her horses and hounds and to the goal of educating others as to their proper care. Upon her death, she stipulated that all of her horses and hounds would be immediately retired and be kept on the property as long as they lived. The Patricia du Pont Foundation was established to see that her wishes were followed. The person entrusted with most of the responsibility was one of her first Fair Hill Pony Clubbers, Grace Terry Hiter. Grace bears an amazing resemblance to Miss Patsy, shares her strong love for horses, and rides every day. Miss Patsy’s legacy will live on through the thousands of lives she has touched. 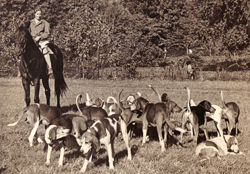 As of the fall of 2013, a new private subscription pack of foxhounds is pursuing the chase just as the Foxcatcher Hounds did almost 90 years ago. In accordance with her wishes, there was no funeral for Miss Patsy. But whenever the hounds are in full cry over the fields of Fair Hill this season, Miss Patsy’s memory is alive. Louisa Emerick grew up near Fair Hill, riding borrowed ponies. She first met William du Pont while she was “trespassing” on Fair Hill: “I was a rag tag kid in jeans, no boots, winter coat on a borrowed horse with an English saddle and western bridle. Mr du Pont was following in his jeep and greeted me warmly. Hounds were running up in the woods where I couldn’t see them, but sound was immediately intoxicating, and that was the beginning of my life long addiction to the sport.” Louisa would end up hunting with Willie du Pont’s daughter, Mrs. Jean McConnell (later Sheehan) when she took over the Foxcatcher Hounds, as well as with Miss Patsy’s hounds. For years, Louisa has operated a small bed & breakfast on the Appleton Road portion of Fair Hill, and she whips-in and serves as secretary for Flint Hill Hounds. 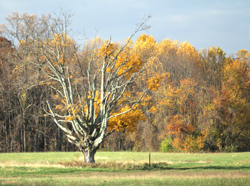 Since Maryland acquired the property, Louisa has been a tireless advocate for the bridle trails and carriage paths. 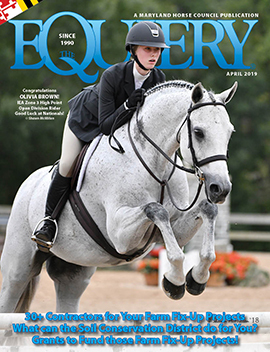 For the fascinating history of Fair Hill, read Louisa Emerick’s article, “Fair Hill: From Foxhunter Paradise to International Equestrian Center,” under “Land Use and Preservation” in The Equiery’s archives.